"BE FIERCE" IN OUR SIGNATURE PAVE ARCHES! Do you feel confused and frustrated when you’re looking for that “perfect” jewelry? It can be an overwhelming task as there is a huge variety of jewelry designs and options out there! Consider investing in one or two beautiful pieces of gemstone jewelry, and you’ll always have the perfect accessory to help you feel great and look timelessly elegant. Gemstones have been the source of fascination since ancient civilizations. It’s not hard to see why-wearing gemstone jewelry instantly elevates your look and makes you look elegant, without much effort on your part. There are many benefits beyond the aesthetic when it comes to wearing gemstone jewelry. Below are 5 incredible and compelling reasons to wear them more often. The right piece of jewelry will not only complete your elegant evening gown, but enhances your beauty. Gemstone jewelry helps you effortlessly achieve a chic and stylish look. When you wear a diamond necklace to go with your gorgeous gown, you’ll instantly look gracious and elegant. Other gemstones to wear for instant elegance include rubellite, opal, pearls, topaz, aquamarine, amethyst and lapis lazuli. The great thing about gemstone jewelry is that they are highly sustainable and lasts a lifetime! You can express yourself with one or two pieces of your favorite gemstone jewelry, no matter the latest fashion trend. That is why uniquely designed gemstone jewelry are a great investment! For example, our timeless collection of Flame Earrings. Exquisitely framed in sparkling signature "Meghna Jewels" 1.32 ct pave diamonds arches with hand brushed 18K gold finish. A fabulous way to add some subtle glamour and edge to your everyday or evening look. These high quality gemstones are a great way to add some subtle glamour to your everyday or evening look. Choose from our wide collection of fine gemstone earrings and look after your jewelry. Each gemstone will bring your special healing powers, while helping you look timeless and beautiful. You’ll be investing in your well being AND timeless jewelry pieces that will last a long time! Gone are the days where gemstone jewelry are reserved only for the rich. With versatile designs and a variety of gemstone jewelry, you can simply invest in gemstone studs and drop earrings and create different outfit combinations! From earrings to rings and necklaces, you can choose a beautiful piece of gemstone jewelry and you’ll look fabulous! Spice up your little black dress or black evening gown with our Claw MarquiseBlack Onyx & Diamonds ring and you’re good to go. Exude elegance confidently with this claw marquise black onyx and diamond ring. You can also opt for our wide range of fine necklaces, such as the Claw Rubelite Diamonds Pendant as the finishing touches to your elegant outfit. Unique and elegant Meghna Jewels’ Claw Diamonds Pendant, available in green onyx, black onyx and rubelite. The world is indeed your playground, so have some fun with uniquely designed and gorgeous gemstone jewelry! Besides the fact that gemstone jewelry are uniquely beautiful, its natural healing benefits are also a huge plus for wearing them! • Aquamarine: symbol of youth, hope, health and fidelity. Has a soothing influence on married couples. Great as anniversary gifts. • Black opal: Believed to be a good luck charm and boasts of providing psychological benefits, including increasing selfconfidence. • Turquoise: Helps to ease feelings of negativity and low self-esteem. • Diamonds: The gemstone mostly associated with love and if you want to impress a woman, this is the one to choose. • Lapis Lazuli: Known to man for centuries, Lapis Lazuli is not only beautiful but the Romans also believed that this gemstone had healing properties. • Citrine: Today, its known as the merchant’s stone and is associated with success and prosperity. This gemstone stimulates power and helps improve your focus. • Fine Moonstone: This gemstone is quite rare and becoming rarer. In colors ranging from colorless to gray, brown, yellow, green, or pink and clarity that goes from transparent to translucent. A balancing stone that has a relaxing effect on most people. • Onyx: Timeless and never goes out of style. Believed to have amazing spiritual and healing properties. Wouldn’t it be great to own jewelry that never goes out of fashion? Gemstone jewelry provides you with timeless beauty that never goes out of style, so it’s a no-brainer to own high quality and uniquely designed gemstone jewelry! A great example would be black onyx gemstone jewelry. It works great for both classic and contemporary outfits, as its color and design works well with many different fashion styles. 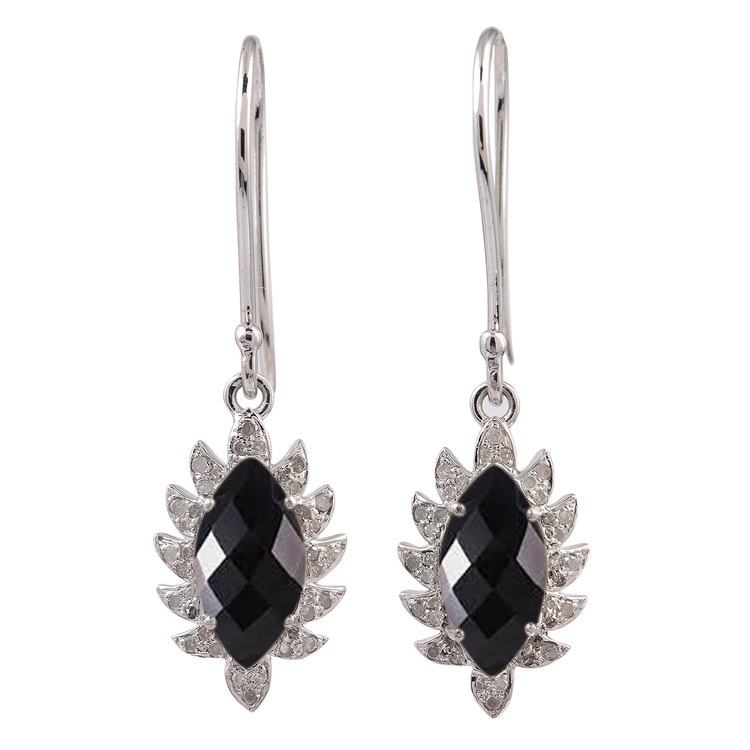 Our Claw Mini Drop Earrings are great for your casual night out and re-purposed for a concert gala the next day! After understanding about the huge benefits of wearing gemstones, I’m sure you’re dying to choose the right kind of gemstone jewelry for yourself! Browse our collection of fine earrings, fine necklaces and fine bracelets and cuffs to get started. For more styling ideas, check out our #MJStyling page here. Be sure to also check out this post for more ideas on how to wear your gemstone jewelry as a statement piece. Look confident and elegant everyday with these uniquely designed Linear Claw Drop Earrings. Designing fine jewelry that captivates women's heart and soul! Thank you for reading my blog. Excited to share my inspiration, my thoughts and a snap shot of my design process. Sign up to our newsletter to receive 10% off your first purchase! Be the first to know about new arrivals, special offers, exclusive launches, giveaway and much more.